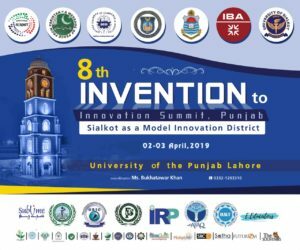 Executive Members of Innovation Summit Panelist From all Departments of GCWUS, Sialkot Chamber of Commerce & Industry, University of Sialkot, University of Management & Technology- Skt, IBA-Karachi and other team members. 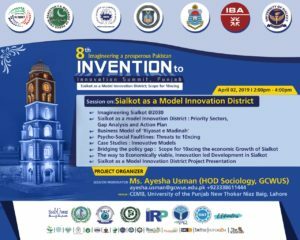 The phrase and idea of Invention to Innovation Summit was coined by Mr. Abid H K Shirwani and initiated by Ms.Ayesha Usman, HOD Sociology – GCWUS. The objective was to provide an annual event and arrange three main stakeholders of Innovation; Academia, corporate sector and public sector, where academia can sell technologies, industries can buy and other stakeholders like Govt. can facilitate the process. It provides an opportunity to showcase the indigenous research which is going on in academia, R&D institutes, industry and public sector organization.